A total of 156 samples with backgrounds from atleast 37 different countries across Asia, the Pacific and the Americas has been used for my main survey findings (see chart above). This seems like a reasonably robust number to pick up on some preliminary patterns. 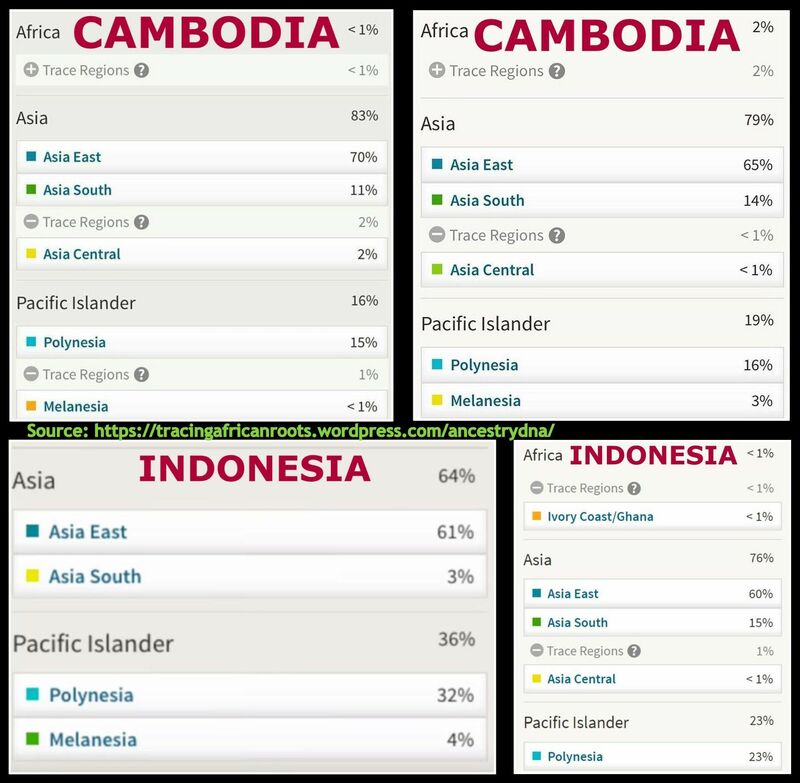 Even when for some of the separate nationalities/ethnic groups i was only able to obtain a minimal sample size. Practically all results have been collected by me from public websites or social media.1 Naturally i verified the background of each sample to the best of my capabilities but i did not have absolute certainty in all cases. 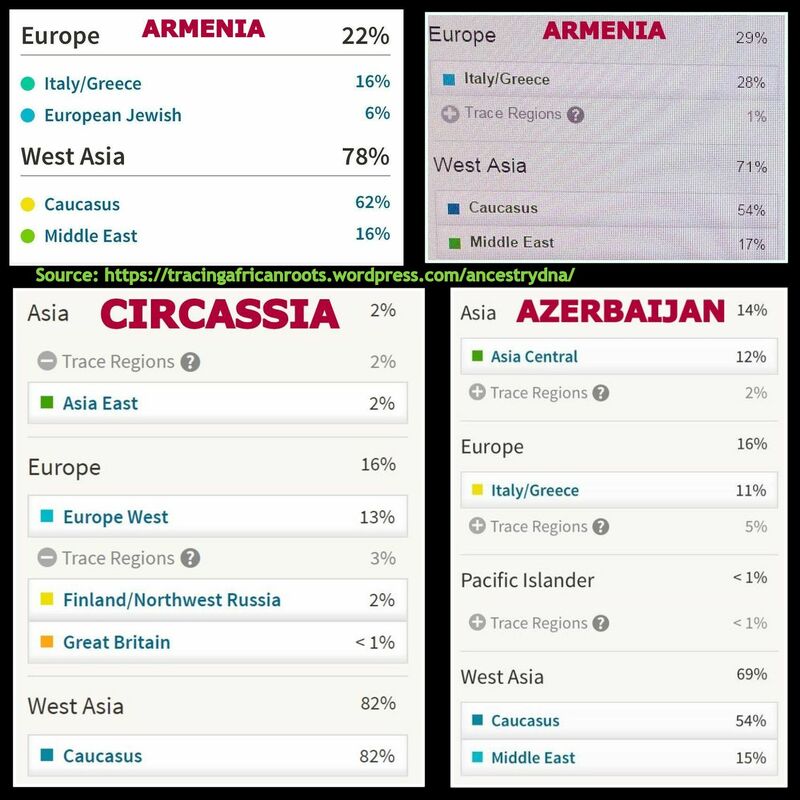 I like to thank all my survey participants for having tested on AncestryDNA and sharing their results online so that it may benefit other people as well! Obviously my survey findings are not intended to reflect any fictional national/ethnic averages! They should be taken as mere indications given individual variation, limitations of sampling, overrepresentation of certain migrant areas of provenance etc. etc. 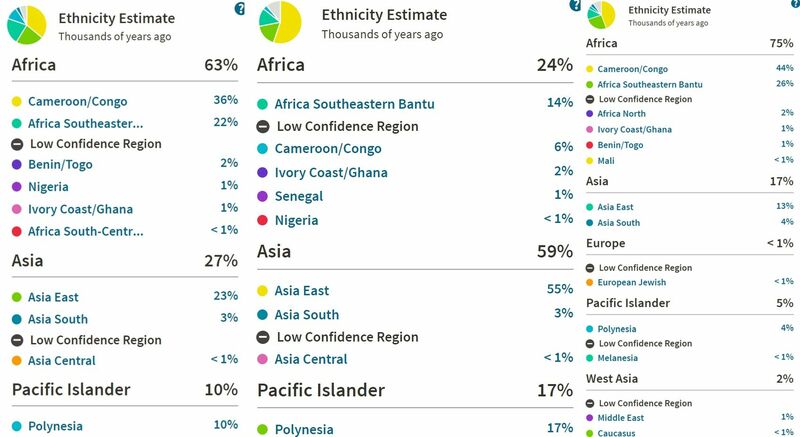 Even despite (inherent) imperfections of the current AncestryDNA set-up I do believe this overview can already be helpful and insightful. 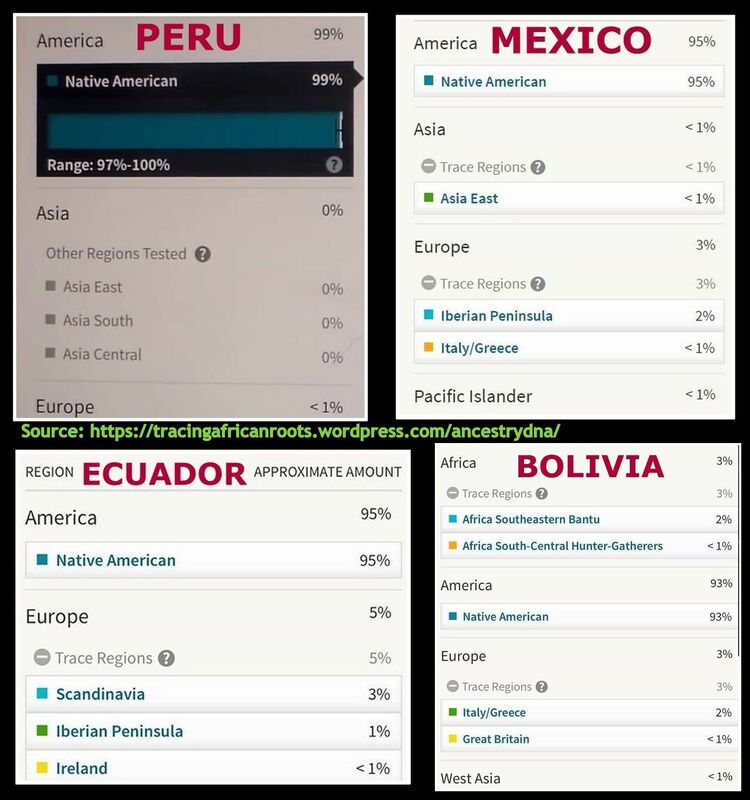 At the very least it will give you an approximate idea of what to expect when wondering about how AncestryDNA results might look like for people who are actually Native American or from Asia or the Pacific! 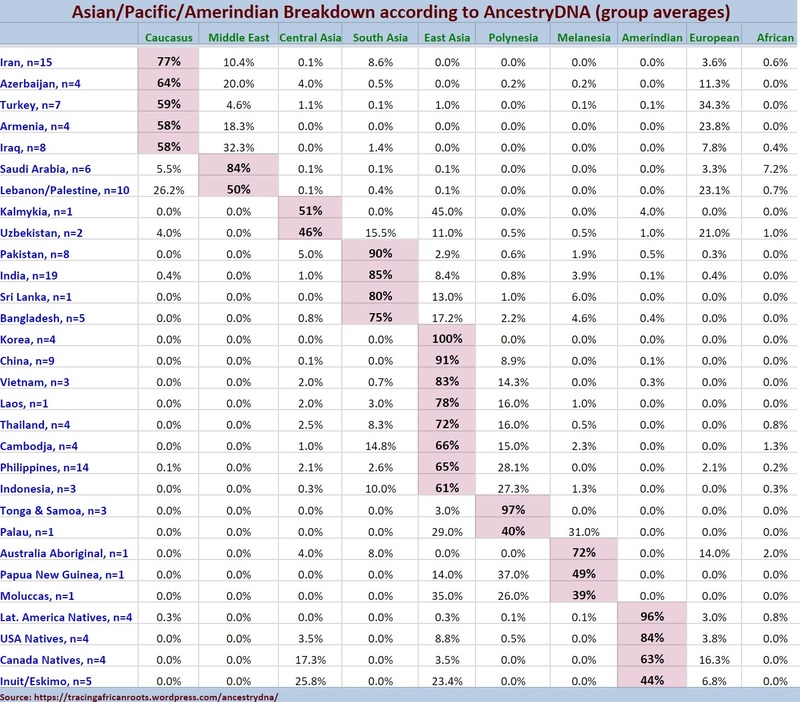 As can be seen from the above chart the prediction accuracy of each Asian, Pacific or Native American region reported by AncestryDNA is variable. The “Asia Central” region probably being least predictive. 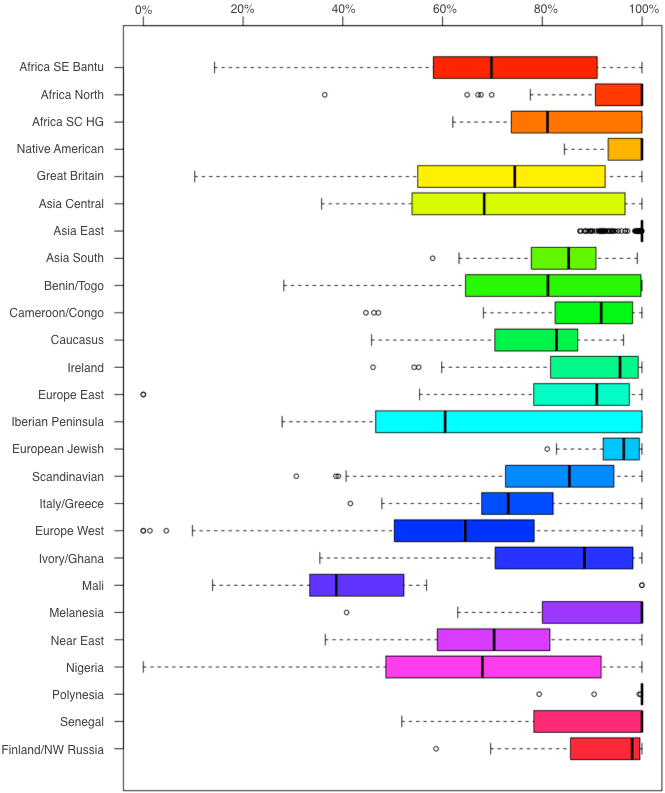 The other regions are sometimes very predictive for selected populations genetically close to the samples used by AncestryDNA , such as Koreans, Saudi Arabians and Pakistani/NW Indians but also Polynesians and Native Americans from Latin America. However neighbouring populations tend to require additional regions which often seem eccentric if you fixate too much on the labeling. This seems to be inevitable given increasing genetic differentation not to be captured within one single lump category. 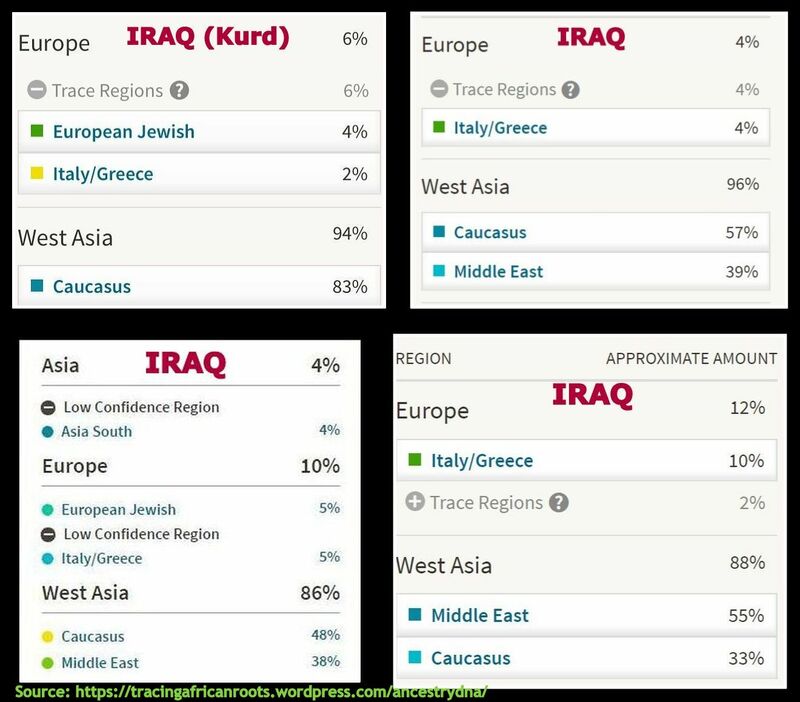 After reading through these links as well as the useful regional descriptions on Ancestry’s website you will realize that it’s only natural that some of AncestryDNA’s regions are more predictive than others. Afterall some types of DNA are less complex to distinguish than others. But also the particular constellation of AncestryDNA’s reference panel and its algorithm being focused on detecting origins from possibly “thousands of years ago” are important aspects to take into consideration. The chart above featuring my main survey findings is therefore best understood when you keep in mind overlapping geography & genetics as well as ancient migrations across the continents. Many Afro-Diasporans will receive considerable scores of either Asian, Pacific or Native American DNA. And often these will also be in line with their known family backgrounds. However for many others it seems that this type of DNA is usually reported as an unexpected trace region. 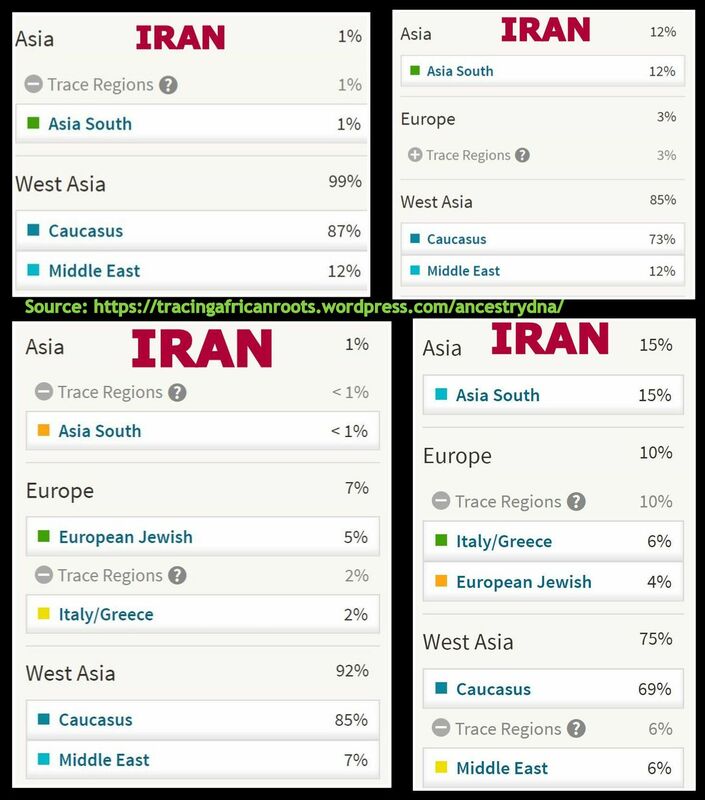 Appropriately termed “Low Confidence” regions by Ancestry since their latest update. As a general disclaimer & reminder it pays to be very careful when wanting to make sense of your Asian/Pacific trace regions. AncestryDNA provides *estimates* and not solid claims of membership to any particular ethnic group! It is well advised therefore to take anything reported at trace level with a grain of salt unless additional clues and corroborating evidence exist. As described in the screenshot above and in greater detail on this page, trace regions are explicitly set apart because AncestryDNA cannot rule out that several regions could qualify at the same time when describing these small DNA patches. Asians, Pacific Islanders and Native Americans themselves also often receive puzzling and unexpected trace regions. 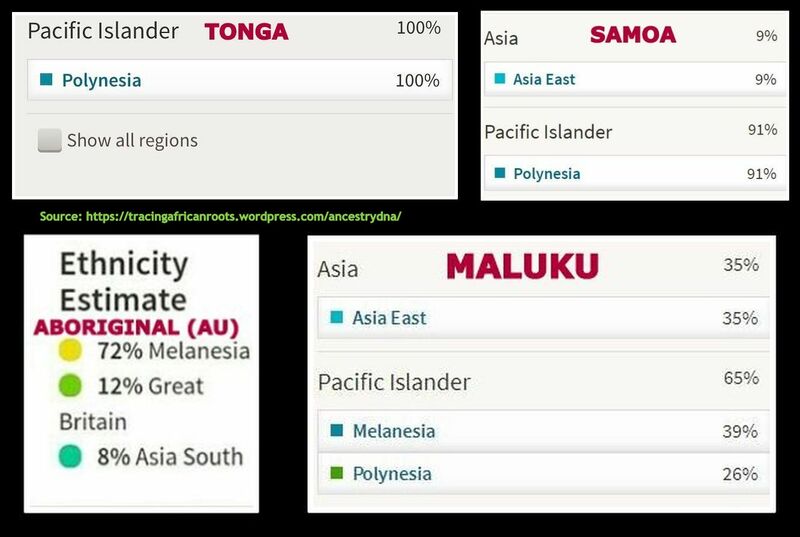 At first sight it may even seem impossible or absurd when for example a person from Central Asia would show a trace region of “Native America” or a person from China is reported with a small amount of “Polynesia”. If you look closely you will notice that even African trace amounts are regularly appearing in the screenshots above. However such outcomes do usually make sense when genetic similarities & ancient migrations are taken into consideration. You will also reach a deeper understanding when you stop fixating on the regional labeling too much. You can still obtain insightful information as long as you adopt a broader perspective on genetics and aim for correct interpretation. Admixture analysis is not perfect but if you familiarize yourself with its inherent limitations you will realize that is in fact unrealistic to expect “100% accurate” results. As abundantly shown on this page genetic diversity is a given for most populations all over the world. Receiving a multitude of trace regions does therefore not per se imply that you have a confusingly diverse background. Rather it might suggest that your ancestors were themselves genetically diverse! But still these ancestors could have been from just one or two ethnic groups only. And to be sure – exactly because Asian, Pacific or Native American trace regions are suggestive of distinctive ancestors – it might in fact also be worthwhile to investigate such minor family lines. As you might find them to be more readily identifiable after performing a dilligent family tree research or by combining with other aspects of DNA testing (haplogroups, IBD matches etc.). So despite their lower confidence trace regions are not to be lightly dismissed either. Ultimately this will all be up to your own personal preferences. But it’s worth repeating again that without additional clues and corroborating evidence your attempts to trace back trace regions to specific ancestors or ethnic groups could very well lead to a dead end. Conjecture and unfounded speculation can then quickly turn to self deception. The “Native American” region appears to be highly predictive for the indigenous people of Latin America. Leaving aside the minor European & African admixture amounts which are afterall historically explainable. 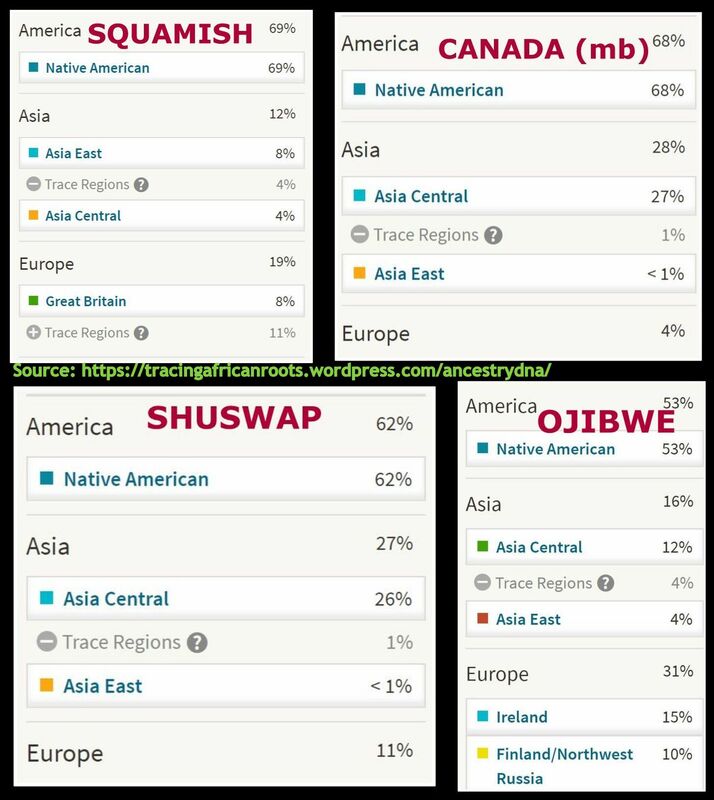 However for the indigenous people of North America it seems that additional Asian regions are often necessary to describe “Native American” DNA. In particular for Canadian Natives and the Inuit. 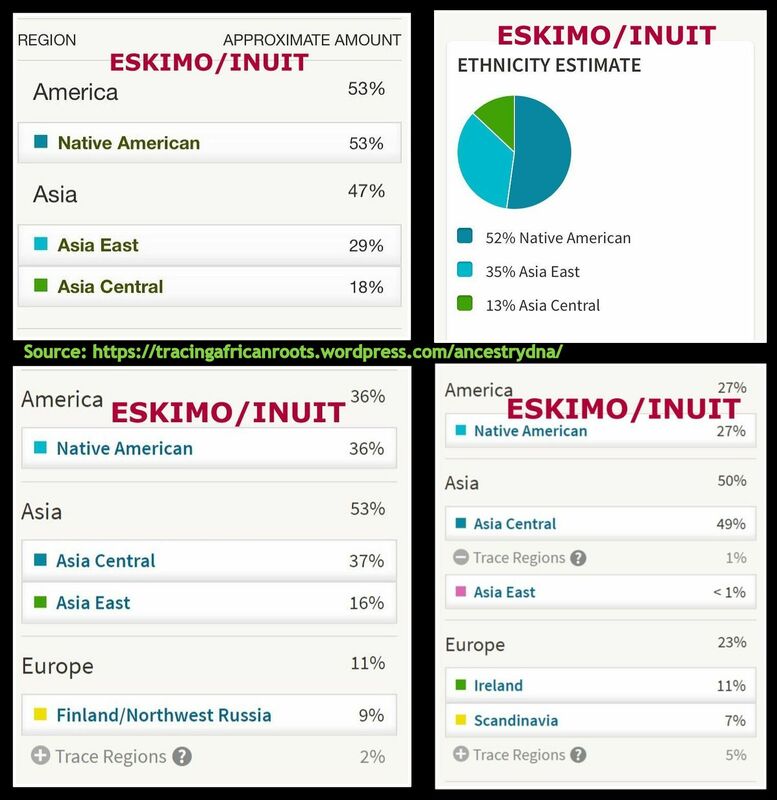 Two Inuit/Eskimo samples i have seen even have “Asia Central” in first place rather than “Native America”! This still makes sense given the original settlement of the Americas by way of Siberia into Alaska (see this link for more details). The strongest remaining genetic connections with Asia would then indeed be located in North America. It is also noteworthy that the distinction between the various Asian regions and “Native America” seems to be blurry at trace region level. 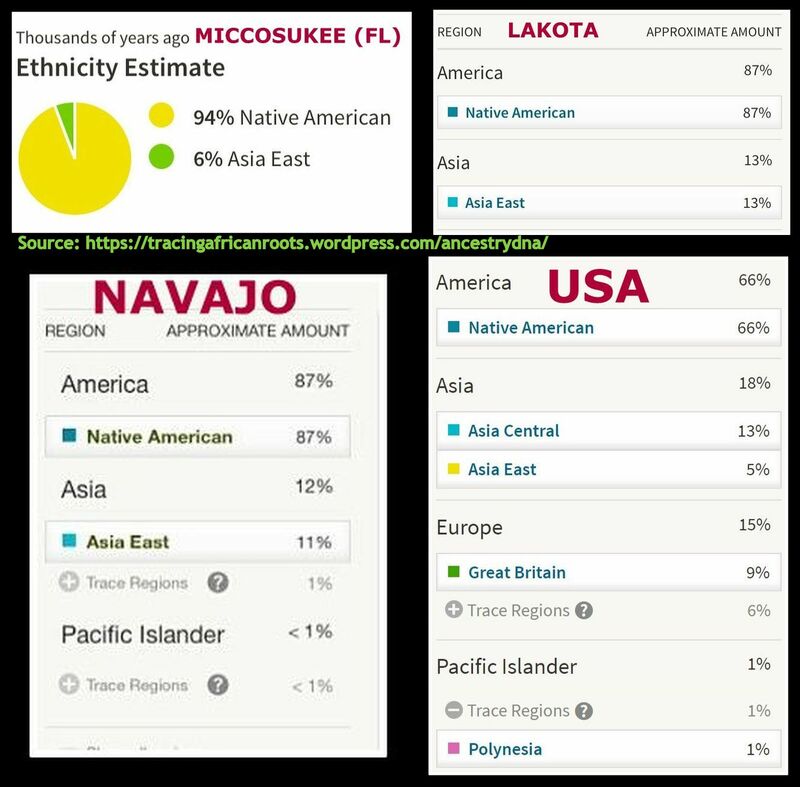 I have observed many 1% “Native America” scores for people from all over Asia. Eventhough i have only seen a very minimal number of Central Asian samples it seems that “Asia Central” might be the least predictive Asian region. This is also in accordance with the chart above provided by Ancestry itself. Using sound judgement recent Central Asian origins can safely be ruled out for practically all Afro-Diasporans. 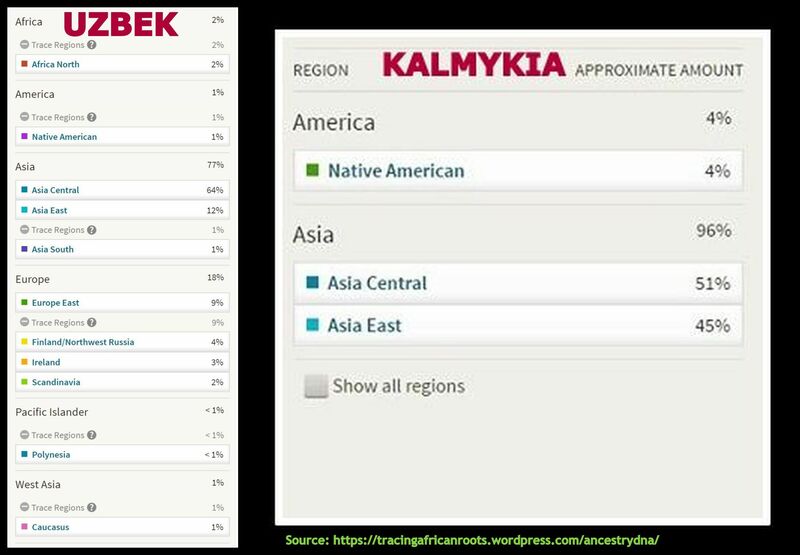 Judging from my North American Native samples, small amounts of “Asia Central” can be assumed to be suggestive of Amerindian ancestry instead. The same goes for any unexpected “Asia East” trace amounts, which also can be misread for actual Amerindian origins. Especially if you happen to have received an additional Native American score. As mentioned already this lack of distinction is due to shared Siberian origins between Central Asians and Native Americans. “Asia South” has a high prediction accuracy for South Asians themselves, all across the subcontinent. Even when additional “Asia East” is needed for populations further removed from Pakistan & Northwest India because of an increasing genetic gradient. When reported for an Afro-Diasporan “Asia South” is therefore likely to be the real thing. Although if it’s reported as a minimal trace region (< 1%) it might of course also just be “noise” or a misreading. 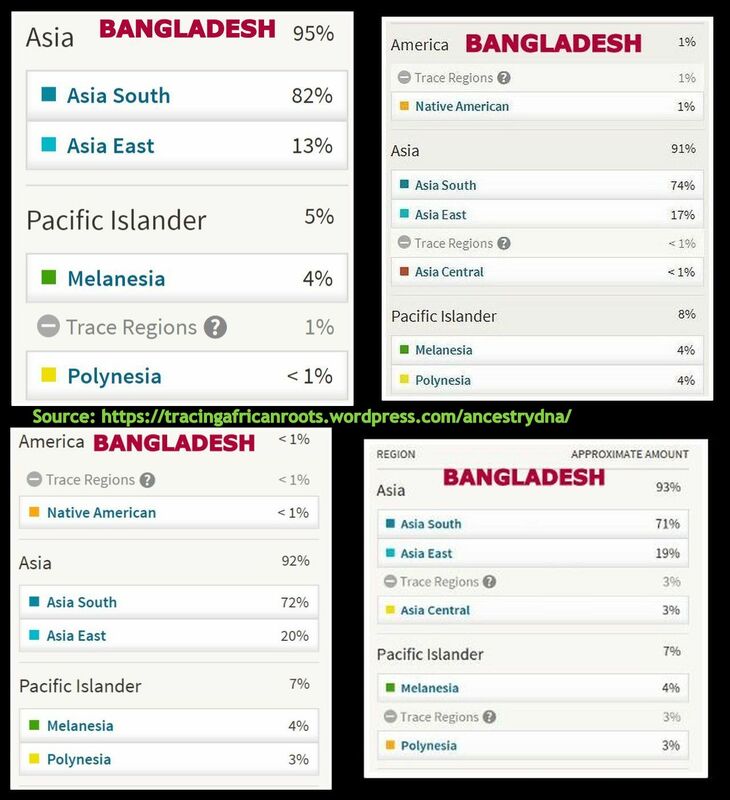 However seemingly as a byproduct it seems minor “Melanesia” scores are to be expected when you have South Asian lineage. This does not imply any actual Melanesian origins! Rather it is to be explained through genetic similarities as a results of ancient migrations originating in South Asia and branching out to the Pacific (see also this link). 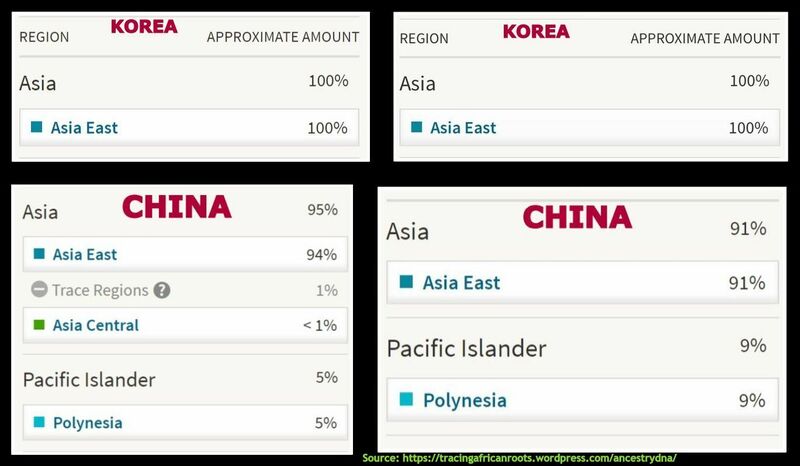 “Asia East” has a high prediction accuracy especially for Northeast Asians, however much less so for Southeast Asians who also receive additional “Polynesian” and to a lesser degree “Asia South” scores. A similar scenario seems to apply as described directly above. It is known afterall that Polynesians migrated from East Asia rather than migrated into East Asia! 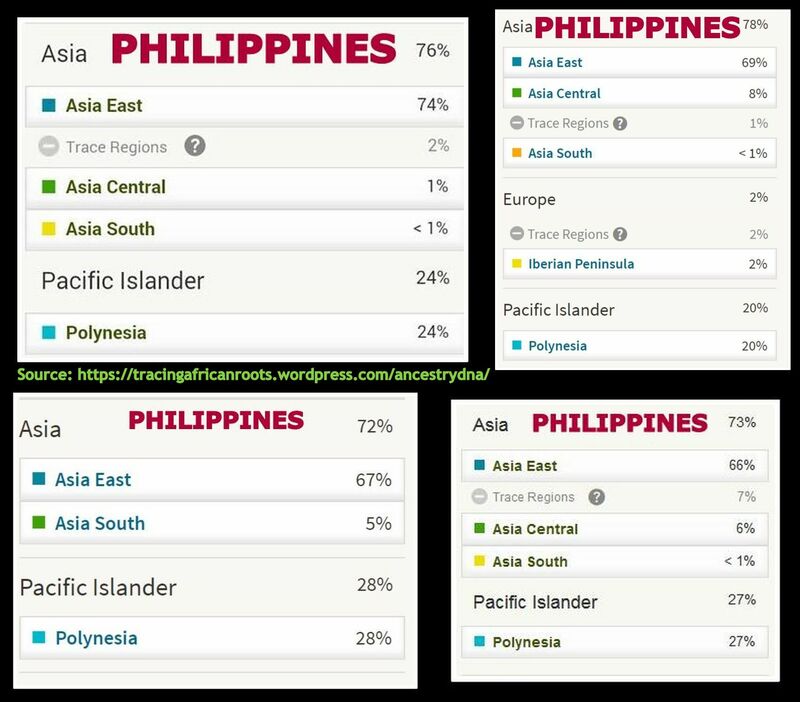 Minor “Polynesia” scores are to be expected when you have East Asian or Southeast Asian lineage. Although if it’s reported as < 1% it might of course also just be “noise” or a misreading. 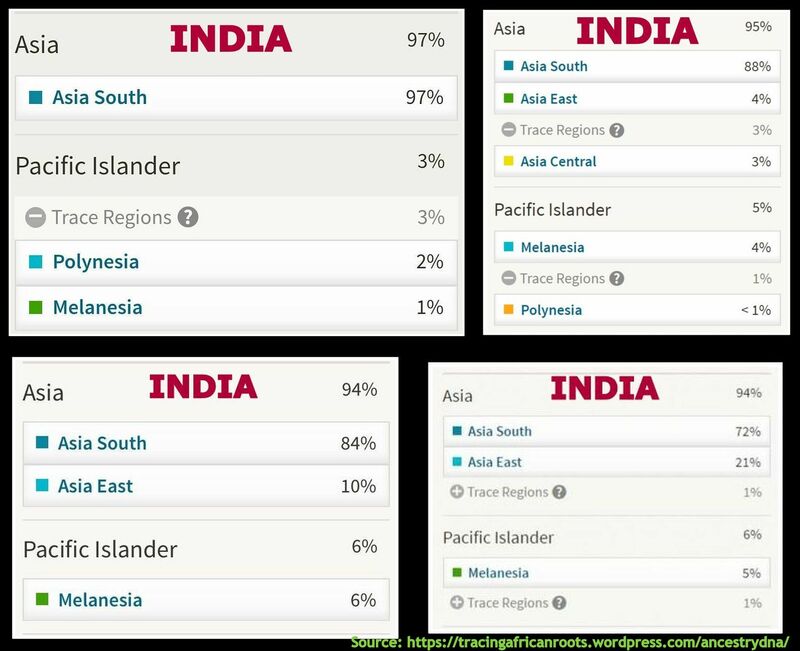 For many West Indians the scenario of Chinese admixture will be most relevant and then some minor “Polynesia” might also appear along with “Asia East”. 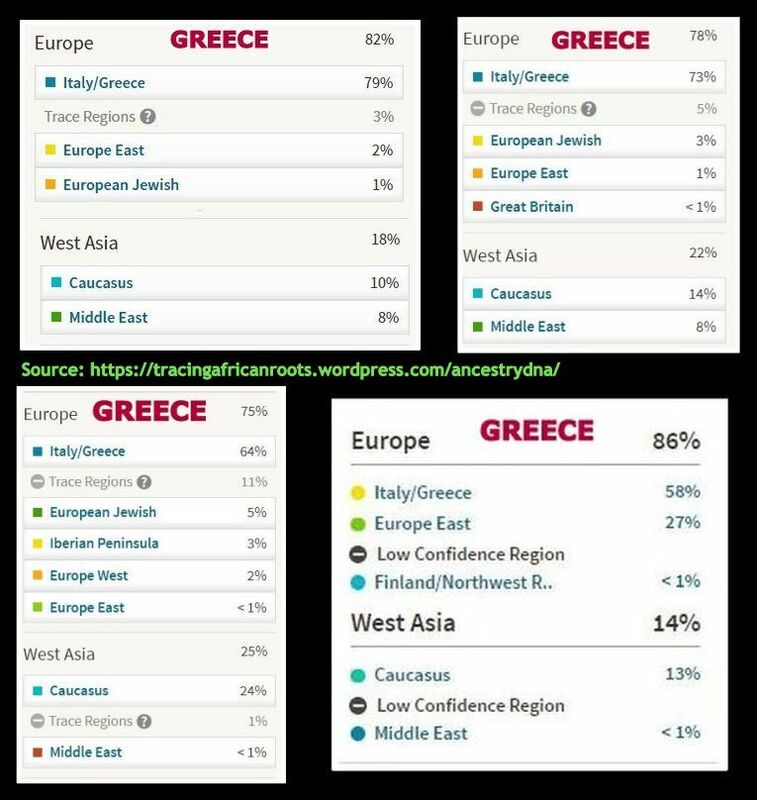 “Middle East” and “Caucasus” are overlapping with “Italy/Greece“ to some minor yet considerable degree for many Mediterranean populations such as Italians and the Greeks but in fact also for many West Asians themselves. It seems to be caused by the large degree of widespread shared deep ancestry between the Near East & Europe. Prehistorical migrations associated with the spread of agriculture rather than any sensationalist historical events might be the real “culprit” in many cases (see this link and this one). 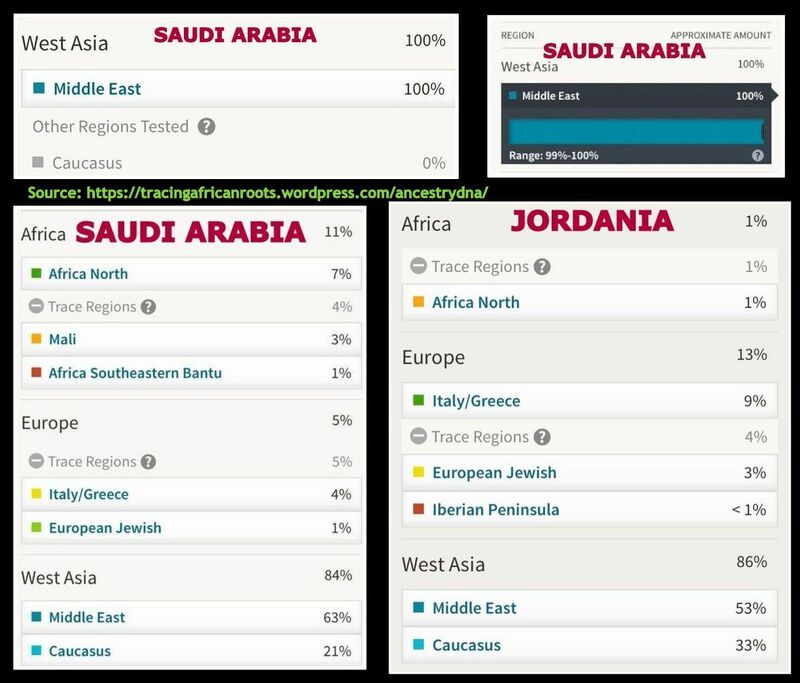 If you receive small amounts of either region and you have no plausible connection to West Asia it might be best to assume it is derived from a Southern European source or else it might just be an invalid trace region reporting. Haha i get what you’re saying about reaching lol. I always argue for caution and being critical when assessing DNA test results. You might still have very distant Malagasy ancestry though. 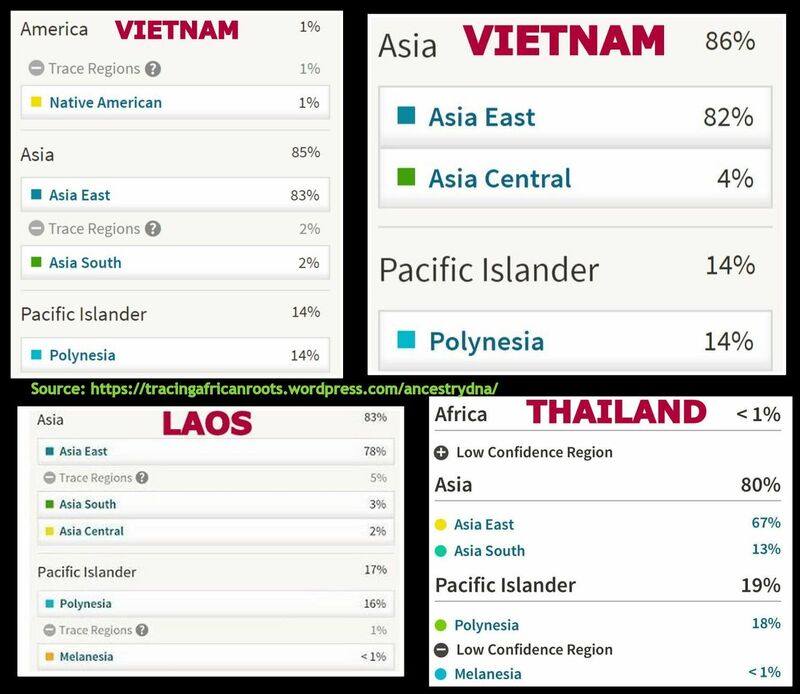 Even if Southeast Asia shows up as <1%, it could still be legit, especially when reported on 23andme i would say. But you will need additional clues to confirm. Best thing would be a DNA match from Madagascar i suppose. Or else perhaps maybe some of your AA DNA cousins have already confirmed for themselves that they have a valid Madagascar connection by way of a Malagasy specific haplogroup. If you can then find a mutual ancestor who is to be found along the same direct maternal or paternal line as your match then you could also have some sort of confirmation i suppose. In some cases your AA DNA cousins might even have already identified a Malagasy ancestor in their family tree. This might be most exceptional but still i have already seen this myself for a few people. If you can then proceed with connecting the dots and find out how your MRCA is fitting in their family tree you could possibly also confirm things. But yeah that's getting close to reaching lol. Like i mention in this blogpost it could be argued that focusing on your primary regions will be more fruitful and meaningful as it will be covering a wider span of your ancestral make-up. On the other hand family is family and each separate ancestral line counts when adding up the total sum of who you are. So this is entirely up to your own preferences. 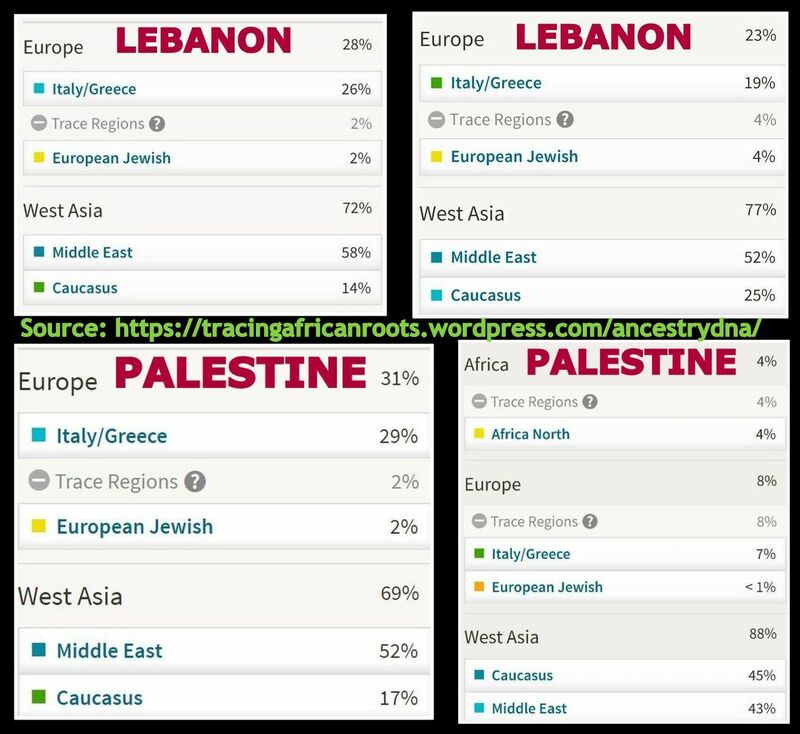 I wonder if mizrachim have high european jewish,or are they mostly middleeast and caucasus. also i’m thinking the roma are going to be a mixture of european,central asian,caucasus,and south asian. i’m wondering whether or not some of those scores for example african americans might be roma related. 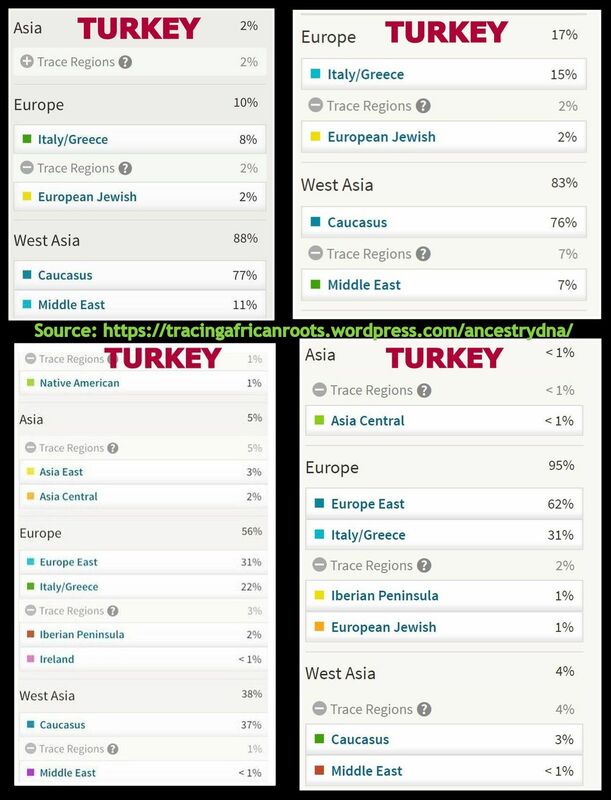 Yes i’m also curious to know how AncestryDNA describes the DNA of Middle Eastern Jews as well as Sephardi Jews. I have seen 1 possibly Roma result sofar who indeed shows up as a mixture of South Asia (24%) as well as Europe & West Asia. 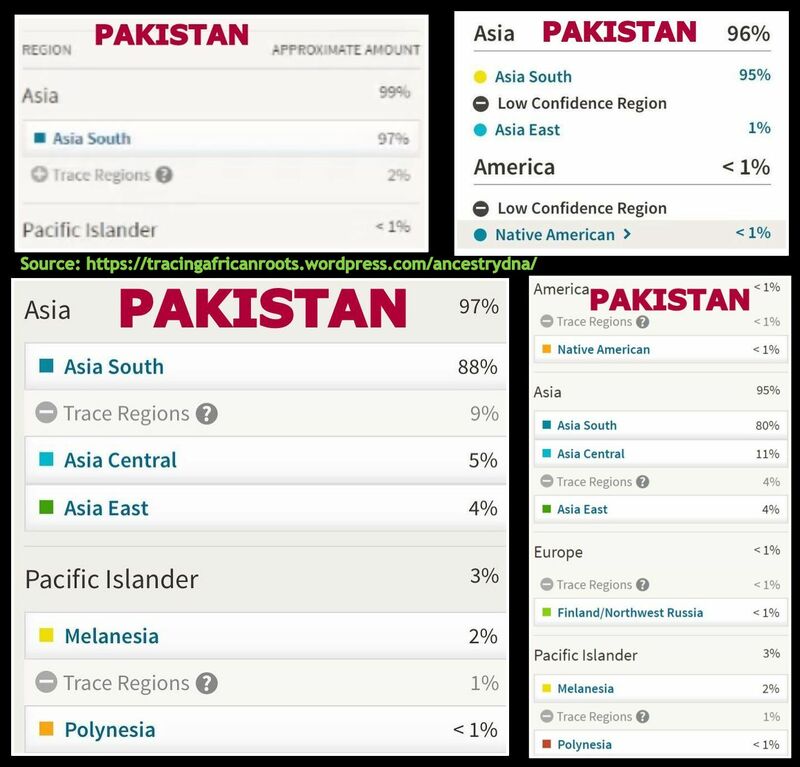 I will post a screenshot in an upcoming section devoted to South Asian results. Hello fonte! sorry for the long reply. I just wanted to give you and update so far on what i have found. so far as much as i have found with the Malagasy segment i do have Dna cousins With Madagascar haplogroups along with the same L0a haplogroup that i have. I match about 2 Yoruba’s an 1 igbo and a Full blooded Akan. Also found out that I have Heritage outside of Maryland and north carolina, as My great grandmother comes from Georgia. So Im not quite sure what particular slaves were brought to that area. So im starting to get somewhere. About Georgia i don’t really have any details but i imagine their African origins are very similar to those for South Carolina. Oh also, i think i mentioned this in a email a while back. But i found out My grandparents (on my mothers side) are related and its kinda been hidden. found out by doing extensive searching of trees and finding cousins. Accidently found out they where cousins in 2 different ways(basically they are related on one branch and related on the other branch also) , so idk how that affects Dna distrubution, My family is large on my mother side so, its extremely easy for cousins to marry one another. Also notice that Fulani have minor amounts of North Africa and sometimes West Asia. Congratz on those Fulbe matches! I take it this is on AncestryDNA? If so the combination of your regional breakdown and your DNA matches is indeed highly suggestive of Fula ancestry. 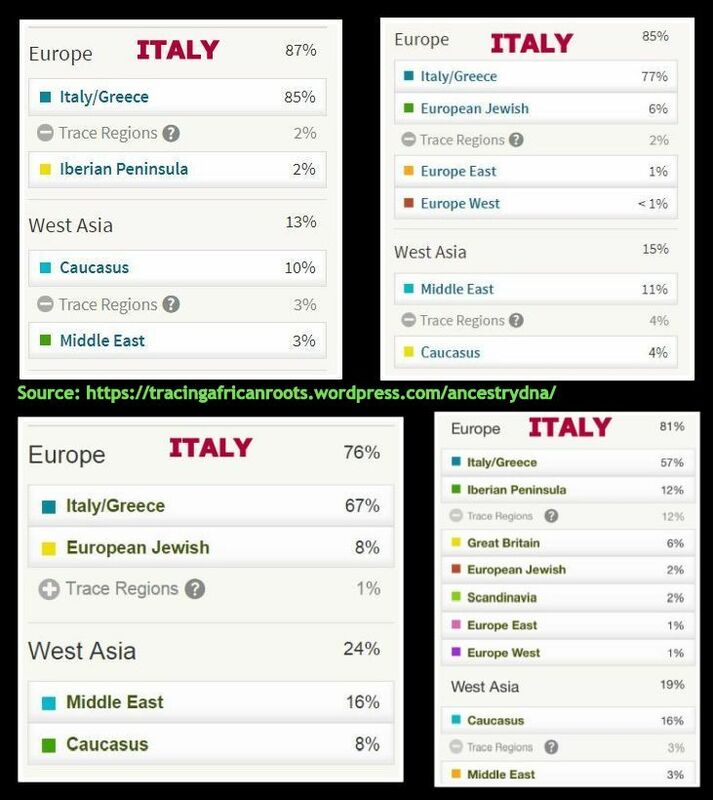 I intend to blog about Fula AncestryDNA results eventually so keep an eye out for that.